For those of you who don't have a ridiculous amount of spare cash kicking around for a real TB303 (and we're willing to bet that's most of you) the Freebass or MB33 is a very close substitute, the only drawbacks being that '303' is all it really does and the filter kind of loses it with the resonance full up and the cutoff over 3/4. BUT WAIT! as ever the nice people at circuitbenders swoop down to rescue you from the tedium of dull acid lines with our bin buggering Acid FM mods! 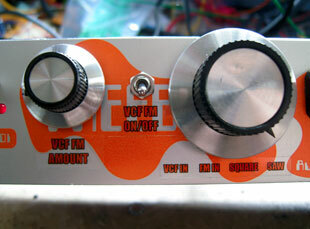 These mods are applicable to the FAT Freebass FB383, next! SPACEBASS 3.3 and the MB33 mkI in all of its many front panels, as they are exactly the same machine inside the case. There's also something called the Terratec SINE MB33, which was available very briefly in certain European countries and we are reliably informed is also the same machine, but we have never seen one. UPDATE 08/2013: Mode Machines have now released something called the 'x0x rack'. 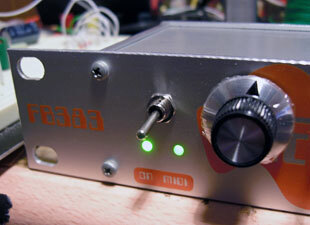 This is yet another re-release of the MB33 with a new front panel but with the name x0x on it. For some reason Mode Machines are claiming that that its a "19" rack mountable version of the x0xb0x", which appears to be an outright lie. Basically this is a blatently cynical attempt to cash in on convincing people that the x0x rack bears more relation to a TB303 than a MB33 does. Its certainly not a x0xb0x in a rack. 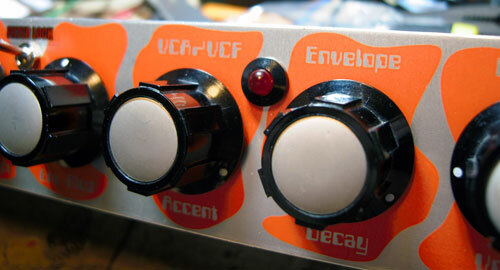 Thses mods will be just as applicable to the x0x rack as they are to every other version of this synth. VCO On/Off Switch: One of the most annoying problems with the Freebass or MB33 is the way that the VCO is removed from the mix when a jack is plugged into the VCF input. This makes it impossible to stick it in a rack without spending half your time reaching round the back trying to find the VCF in socket. We have solved this problem by preventing the VCO being automatically cut when a jack is inserted, and instead adding a VCO on/off switch to remove it manually if you chose to. 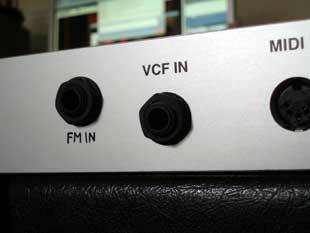 This means you can now permanently wire the VCF input into a patchbay. 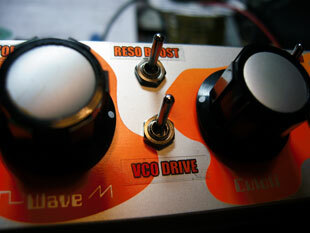 VCO Drive: In our experience onboard distortions tend to be rubbish and you'd do a much better job driving an acid line through an analogue mixer so this isn't really a super distortion but rather just drives the VCO into the filter to add a little more bite and dirt to the acid sound. Resonance Boost Switch: Another annoying issue with these machines is that the resonance never reaches self oscillation (but then neither did the TB303) and also drops off considerably when the cutoff is over 3/4 of the way up. We've solved this problem by adding the resonance boost switch. With this switch activated the filter starts to squeal with the resonance about halfway up and then just screams at any higher settings. 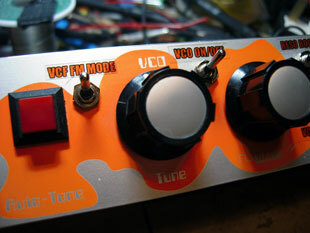 The other controls in the FM section are the VCF FM on/off switch, which, in line with common convention turns the VCF FM effect on and off, the FM mode switch which selects between two slightly different FM responses, and the FM amount knob. This final knob controls how much the source signal modulates the filter cutoff. For demo mp3's of these mods click on the buttons below. The first demo mainly features the VCO drive and Resonance Boost, the second and third are some filter FM action from internal and external sources. The final demo is of two percussion loops sent through the filter section. These videos also feature the optional Filter Lock, Power Switch and Accent LED mods available below. 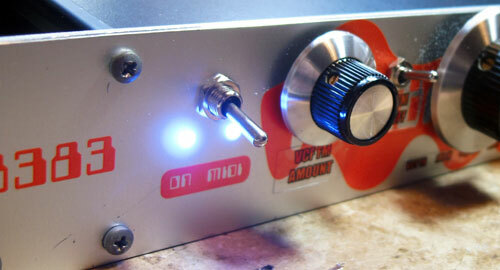 The following extra mods are only available if we are installing the Acid FM mods at the same time. One of the major drawbacks of these machines is the lack of any MIDI knob control. While we can't add straight MIDI control this mods addis a 1/4 inch or 3.5mm jack (state your preference) round the back of the machine that will accept an external CV to control the filter cutoff. We can set up the input so that it will accept a CV input of either 0-5V which will allow you control over at least 95% of the filter cutoff range. Certainly more than enough for a rushing acid builder! Another annoying feature of these machines is that if you want to use the VCF input to filter external audio signals you have to trigger the filter and VCA envelope using a midi note message, the filter then closes until it receives another midi trigger. This also means that by default the external signal will have the VCA and VCF envelope applied to it, so regardless of what kind of sound the external signal actually is, it will have a TB303 filter and amp envelope. While this can be useful on some occasions, most of the time its just annoying so what this mod does is add a switch that locks the filter and VCA open at a constant level without having to use any midi input. 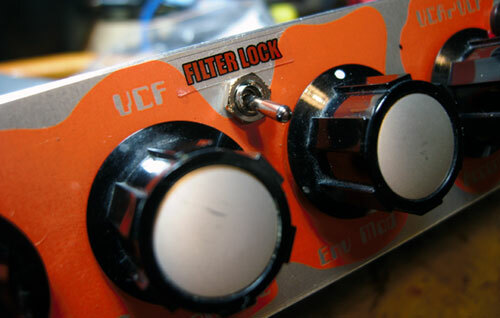 The filter can then be adjusted in realtime using the cutoff and resonance knobs. In their infinite wisdom FAT / MAM or whatever they were really called, chose not to include an on/off power switch, so in order to turn the machine off you have to actually unplug it. This simple mod adds a power switch above the LED's on the front panel. You may ask why? But possibly the question you should be asking is 'why not?'. This mod exchanges the standard red power and midi LED's either for bright blue ones, or for a colour of your choice depending on what we have in stock. It serves no purpose other than to make your rack look at least 63% cooler. The Freebass/MB33 triggers an accent on a note when its midi velocity is 120 or more. 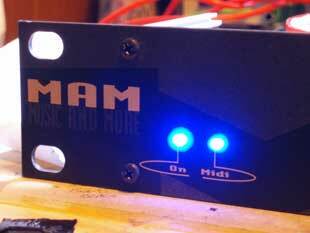 This a simple but useful mod that gives you an extra LED (red or blue) that flashes whenever the accent is triggered, regardless of the setting of the accent amount knob. This can be handy when programming sequences via midi, or in a live performance or recording situation where it might be useful to know where the accents are without turning up the knob and hearing the effect. We also probably shouldn't forget the main reason for this extra LED, i.e. extra flashing lights are always welcome on anyones rack! The LED only flashes when an accent would actually be audible with the knob turned up. As with a real TB303, on the MB33/Freebass you can put a glide/portamento on a note so that it slides/bends into the next note without the envelope retriggering. If you put an accent on the note being slid into (is slid a word? ), then with the envelope decay turned down, you won't hear the accent peak and the LED won't flash. As you turn the decay up then the accent will start to produce a kind of slow attack punch in the bending note, and the LED will flash to show an audible accent is present. It also flashes on normally accented notes. MODIFICATION DEAL: Get all the mods installed on your synth at the same time for £145, a saving of £10 on the normal price. If you want your FREEBASS / MB33 modded get in touch using the CONTACT form.